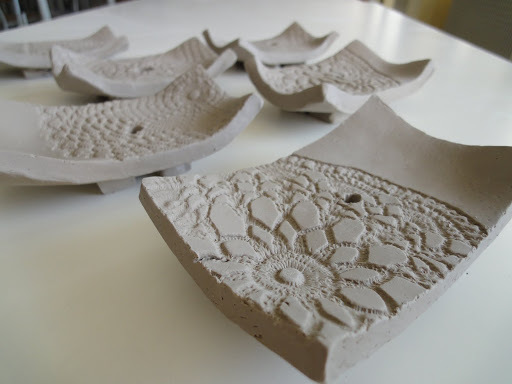 These are slabs of white clay, we added texture with doilies, pressing them on the clay slab, then we put the slab in a small dish to give it the curved shape (it’s possible also to dry it with a hairdryer). 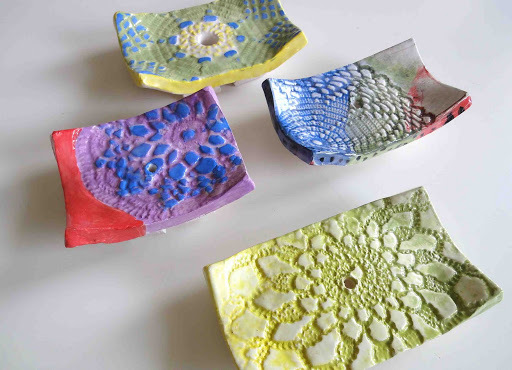 When it is dry you have to fire them in the kiln and then you can paint the doilies impression with colour for ceramic (these are coloured clay called Engobe, we paint the ceramic after the first cooking in kiln). You paint the surface with engobe that is like a gouache colour, then you can wipe the surface with a sponge so the engobe remained in the furrows of decoration and then you can add different colours. At the end you must glaze with transparent glaze and cook again in the kiln. 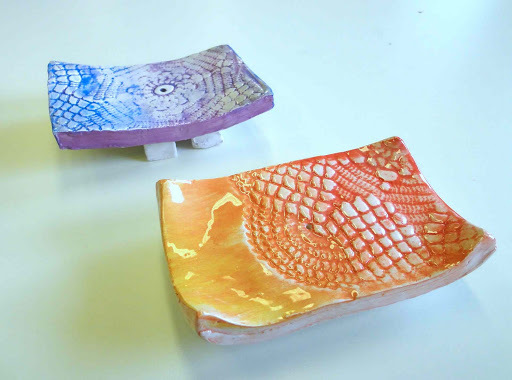 You could even use directly colored glazes. Molto molto molto belli. Peccato che qui alla nostra scuola manchi il laboratorio di ceramica, forno compreso. DO YOU SELL THESE PLEASE? These are beautiful. Did you use plastic doileys? 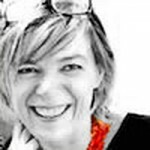 Hi Beck Eaton! I used cotton doileys, handmade by my mum with an ancient italian technique (it is “uncinetto”… I can’t do it!). These are beautiful and the effect on the clay is so realistic! Me piace molto , e una pena chi e fatto in Italia . My husband just forward this post to me, I love these! I’d love to feature them in my shop, where can I buy these? Hi, nice to meet you! These soap dishes are made from students of a secondary school, and unfortunately we can’t sell these! 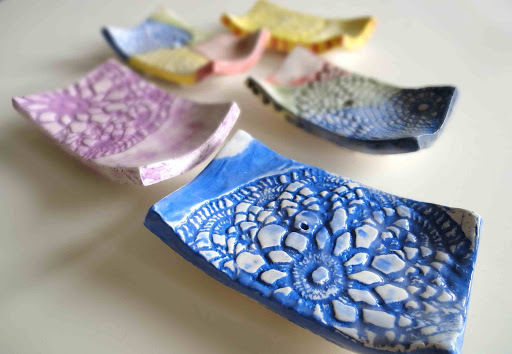 I’m sure that you can find something similar on the web: for example, have a look here https://www.etsy.com/listing/157840279/turquoise-ceramic-soap-dish-lace-decor?utm_source=Pinterest&utm_medium=PageTools&utm_campaign=Share. Can this project be completed in 5 days. 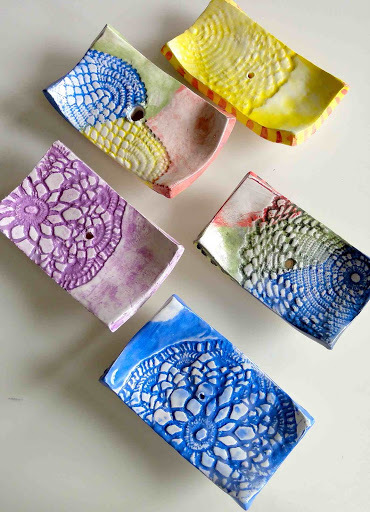 We were thinking of adding this to our summer camp offerings, but we were not sure if the creation and firing process could be accomplished in one week, by middle school children. It depend on the weather, if there are sunny days the clay could dry very fast. The dishes are quite thin and if you have a dry environment in two-three days could be possible do dry them completely. Is a bit risky if you are not sure about the weather… You also need to fire the dishes two time if you would like to add the glaze. How many children do you have? Because you can also use a hair-drier to make the clay drier and harder.